Commodities Supercycle Metals and Mining's Merger Mania! 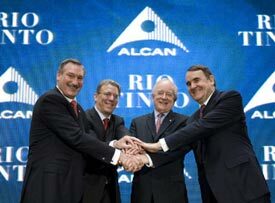 Before BHP launched its bid, Rio Tinto itself was in the process of buying Montreal-based Alcan for $38.1 billion. Teck Cominco is working on a $3.8 billion deal for Aur Resources. Yamana Gold is wrapping up a deal in which it will merge with and acquire two companies for a total of $4.6 billion. Russian mining giant Norilsk beat out Swiss-based Xstrata to buy Canadian/Australian nickel miner LionOre for $6.8 billion. And now Norilsk may merge with Russian aluminum giant RUSAL. It's easier to devour the competition than dig. Why doesn't BHP just open new mines? While there have been some major discoveries — most notably in Africa, Canada and Australia — there is a distinct shortage of BIG projects in the pipeline. Sure, there might be some more elephant-sized deposits out there to be discovered, but they will take time to find and develop. And BHP has to feed ravenous, emerging market economies now. The commodity supercycle has a long way to go. It's being fueled by double-digit GDP growth in India and China, which are both furiously building out their infrastructure, and by 2.5 billion new consumers lining up to buy everything from clothes and cutlery to air conditioners and cars. The supply/demand squeeze in natural resources is getting worse. With rare exceptions, most natural resources are in tight supply and getting tighter. BHP must think this trend is going to continue, or it wouldn't be buying Rio when the company's stock is already up 160% in the past year! I expect the deal-making frenzy in natural resources will only intensify! The last round of M&A mania occurred before sovereign wealth funds (SWFs) became big players at the table. These large investment funds are controlled by countries as diverse as Russia, China and the Middle East oil sheikdoms, and they're being used to plow huge foreign reserves into other areas such as natural resources. China is sitting on $1.43 trillion of foreign exchange reserves. It's already put about $205 billion of that into an SWF. And now they're casting hungry eyes on companies that supply the natural resources they need. But China isn't even one of the biggest SWF funds. Among the largest sovereign funds are a Norwegian fund with $330 billion and a Saudi Arabian fund with $300 billion. The big enchilada is the United Arab Emirates' fund with $875 billion in assets! All told, sovereign wealth funds represent a pool of nearly $3 trillion today. Not only is that more than the $1.5 trillion in private equity firms, but the amount of cash and assets in SWFs should rise to $8 trillion within the next five years. And that's a conservative estimate. Some analysts estimate that by 2010, thanks in part to swelling oil revenues, sovereign wealth funds could have about $17 TRILLION. That's enough to buy every publicly-listed company in America ... with change left over! Where in the World Will All That Money Flow? There's no guarantee what exactly sovereign wealth funds will buy, but it looks like natural resources will be front and center. That will create even more competition for big companies like BHP, which are looking to grow — fast! Another factor: The skidding U.S. dollar, which is slumping against pretty much every major currency in the world, makes U.S. producers look darned cheap to big investors from around the world. So, I think U.S. natural resource stocks are on the shopping block. But the big new discoveries are overseas — places like Brazil, Canada, Australia and China. And that's where I'll cast my net, investing in stocks that could double or more practically overnight as the feeding frenzy starts in earnest. Gold: This year, despite soaring prices, gold mine production actually went down. Next year it should go up — by about 3% — but demand from both jewelers and investment funds is red-hot. Heck, ETF demand is so hot it could be a game-changer for the gold market. Take a look at this chart of how much gold is held by different ETFs around the world. As you can see, ETF demand for gold soared 617% in the third quarter. Combined with growing demand for gold jewelry in China, India and the Middle East, this should easily take up all the gold that mines can supply ... and then some. Platinum: Platinum mines have experienced a rash of shutdowns due to safety concerns, and that's not likely to change next year. The world's third-largest producer, Lonmin, has already indicated that production will fall short of this year's targets. End result: Platinum prices could soar! Uranium: While production is forecast to rise 18% next year, one uranium miner after another has come forward this quarter to announce disappointing results. Next year should be no different. For example, Cameco's big project at Cigar Lake has been pushed back to 2011 as they try to drain a flooded mine. Meanwhile, the World Nuclear Association reports that there are 439 operating nuclear reactors, 33 more under construction and 316 planned or proposed. Demand is going to ramp up fast and furiously! Copper: Although this industrial metal was in short supply in 2007, that's supposed to reverse in 2008. Don't hold your breath. We hear about big mines in South America shutting down for one reason after another and projects in Africa are dogged by delays. I expect more mergers here too, on top of the veritable merger bonanza we've already seen in the past year. Nickel: Nickel was in a 30,000 metric tonne surplus this year, and nickel mining stocks still marched higher. With China's steel production quadrupling in the past four years, nickel demand is only going to become more acute, and some experts expect a 5,000-tonne deficit next year. Nickel stocks could be on the launch pad. I could go through other metals — iron, silver, zinc, aluminum and more — but you get the picture. The outlook for metals is very bullish for at least the next year ... and probably at least the next five years. That should turn the merger-and-acquisition scene into a feeding frenzy. How You Can Invest in This Profitable Mega-Trend? You could buy one of the mining ETFs. For example, the S&P Metals & Mining ETF (XME) gives you broad exposure to the industry, including a bunch of potential buyout candidates. Or you could concentrate on gold miners. After all, just this past year, in addition to Yamana's deal, we saw gold kingpin Newmont announce it would buy Miramar Mining ... Rusoro Mining buy the Venezuelan assets of Gold Fields ... and Barrick Gold bid $805 million for Arizona Star Resources. This trend should continue ... even accelerate. So if you're taking a shine to the M&A potential in gold miners, consider buying the Market Vectors Gold Miners ETF (GDX). It has plenty of names with buyout potential. As for me, I like individual stocks and the moon-shot potential you get in small-caps. For example, in my Red-Hot Global Small-Caps service I recently recommended an under-the-radar, Asian mining company. It already has a producing mine, is quickly ramping up production and you can buy its resources, even after mining costs, for about 34 cents on the dollar! Why is it so cheap? Because it's in China and no one knows about it ... yet! But as gold prices go higher, to $900, $1,000 an ounce and beyond, you can bet that big money will come sniffing around this undervalued nugget of a company. A potential buyer might be a big miner, or it might be a sovereign wealth fund — but as I just showed you, there is a wall of money poised to flood into gold and other natural resources. And I'm aiming to help my subscribers make the most of it! P.S. If you want to get on board with my latest precious metal picks in Red-Hot Global Small-Caps , just call 800-898-0819 or subscribe online .